Thank you for visiting Sweet Season Quilts. 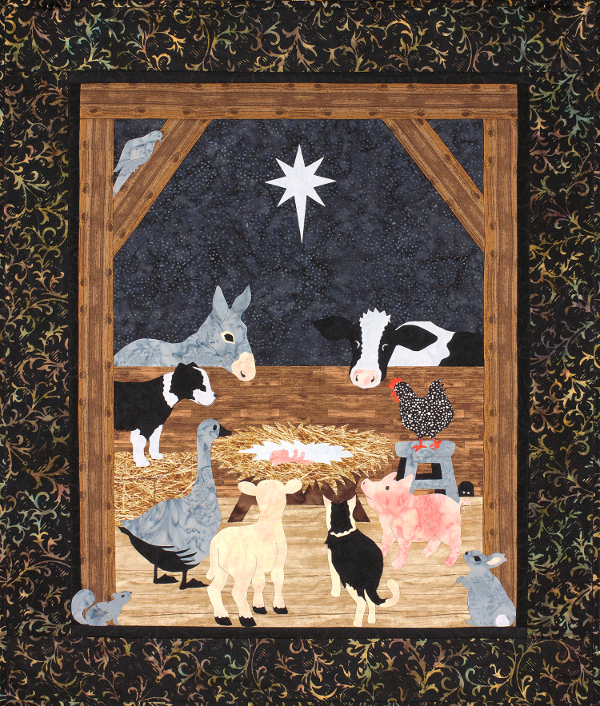 Below are my available patterns, the newest is A Barnyard Christmas. 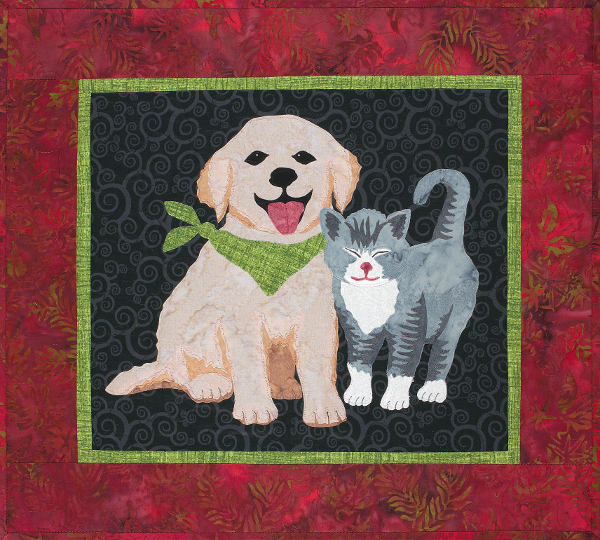 All patterns are available for purchase here through PayPal or contact your local quilt shop. 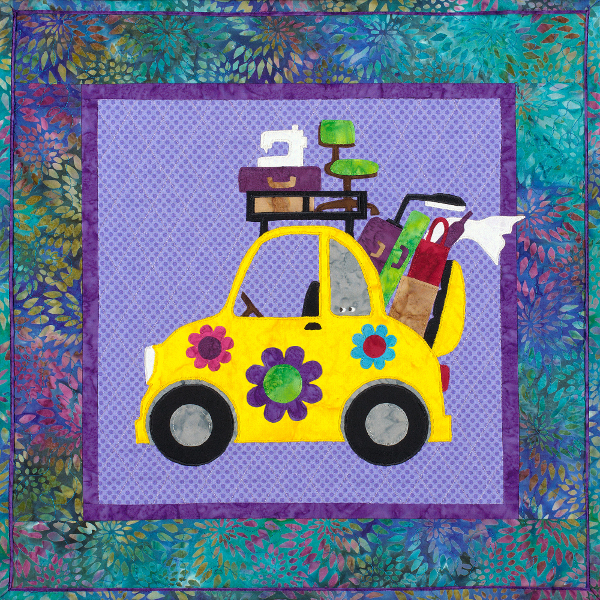 Quilt Shop Owners, if you’d like to carry my patterns in your store, please use my site contact form for information regarding wholesale orders. Please include your phone number and I’ll call OR email you as soon as possible. You may also purchase my patterns from Checkers Distributors at www.checkersdist.com. Sit back and watch the waves come in, see sailboats drift by, and enjoy the lighthouse view. Oh and there’s chocolate cake, too! Tea By The Sea. 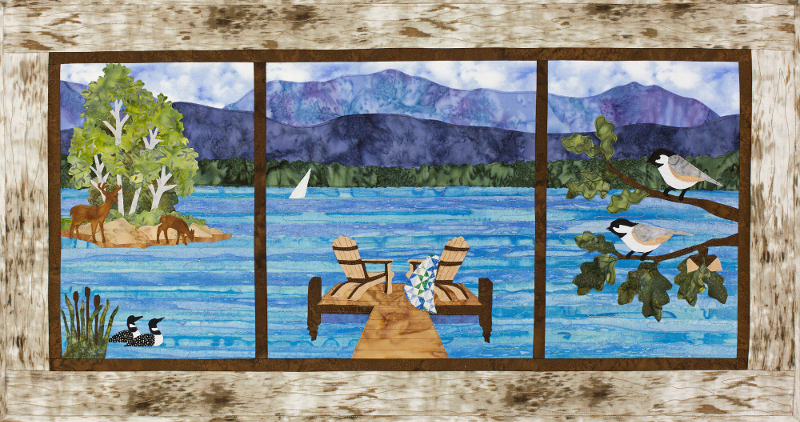 The perfect northern window scene – the lake, dock, wildlife and distance mountains! All viewed from your window. My Up North Window. 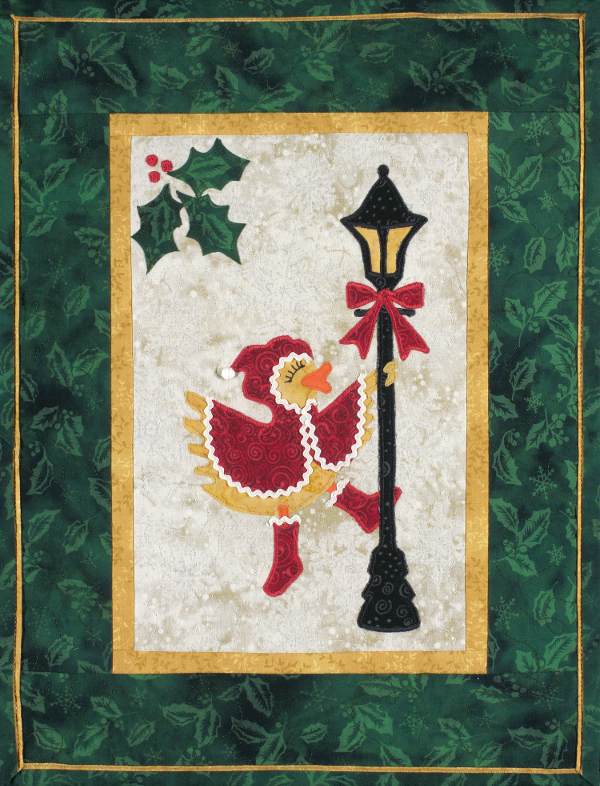 It’s always a good time to make a fast and fun wall hanging for Christmas and the winter season! “Merry Ducky” fits the bill! Merry Ducky. The witch is ready to RIDE! 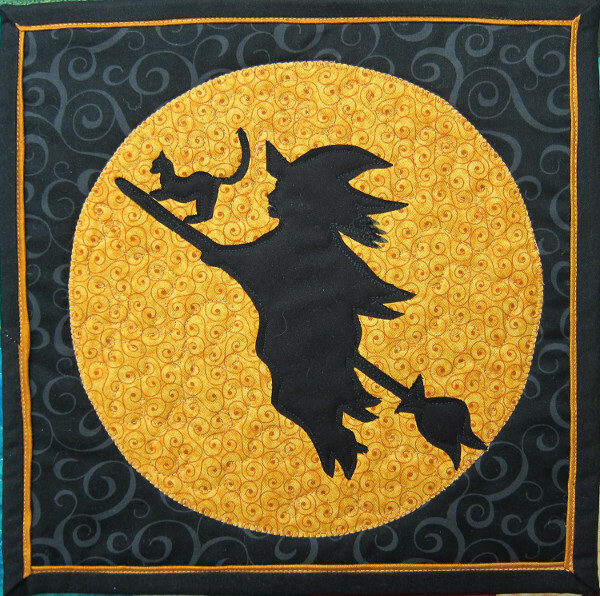 Another fast and fun wall hanging for Halloween (or anytime)! Witchy Moon. “Lets go to the Beach!” Feel the sand between our toes, take a dip in the ocean, enjoy balmy breezes, explore sand dunes, and. . . .if we’re really lucky, we could see baby turtles! Turtle Beach. Who doesn’t love a puppy, and what’s better than one puppy? Two puppies in a canoe! They’re both quite fascinated by the frog, or could it be the water lily? Whichever it is, they sure are cute! Puppy Canoe. Are you looking for a fast and easy weekend project? Here’s the one for you! Cabin at the Lake. 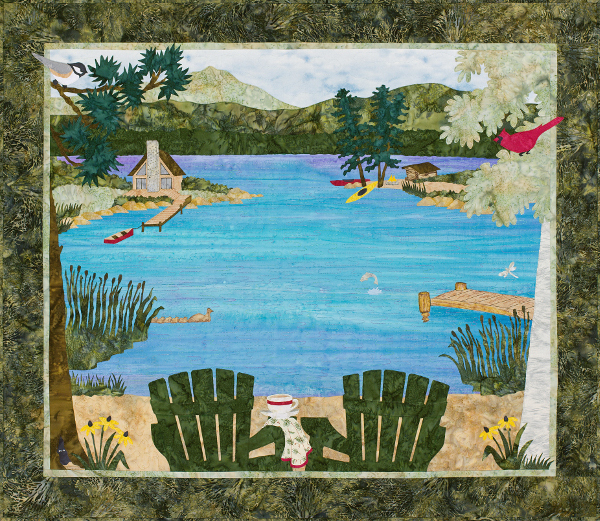 What could be better than sitting on the dock, watching the sitting sun’s reflection on the lake and wrapped in your favorite quilt? Oh yes, a glass of wine, too! Sunset Lake. Do you need a huge bag for going on retreat? This is the one to make! 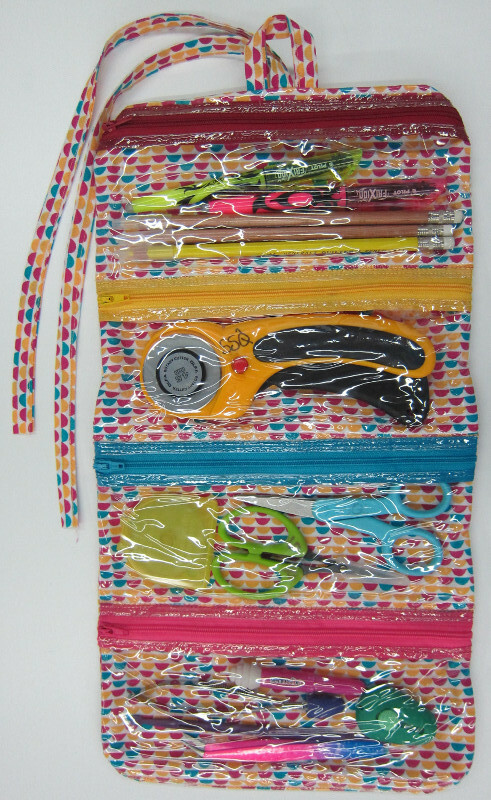 It’s perfect for all your projects, notions, fabrics, etc. etc. to take along! My Retreat Bag. Going to the Beach? 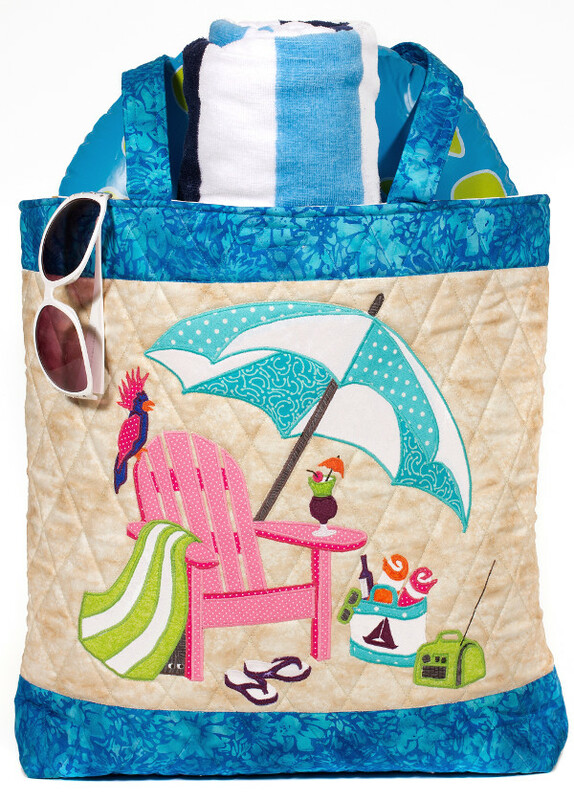 We all know that you’ll need a huge bag to hold all that beach “stuff”; lotion, towels, sunglasses, flip-flops, etc., etc.! 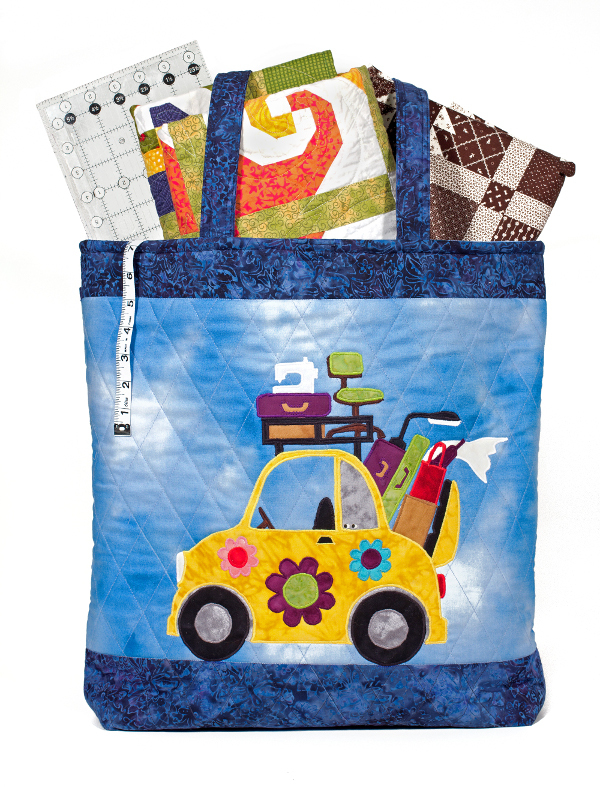 This is the perfect bag to make! My Beach Bag. Ready for Retreat is the perfect beginner project that quick to make, requires very little fabrics and supplies, AND is super cute, too! Ready for Retreat. At the Beach is the perfect beginner project that quick to make, requires very little fabrics and supplies, AND is super cute, too! Read more about At the Beach. Nothing could be better than summer vacation at the cabin and seeing this view from your sewing room! Oh, you don’t have a cabin with a window view like this? Well now you can make it and customize it to your own design. 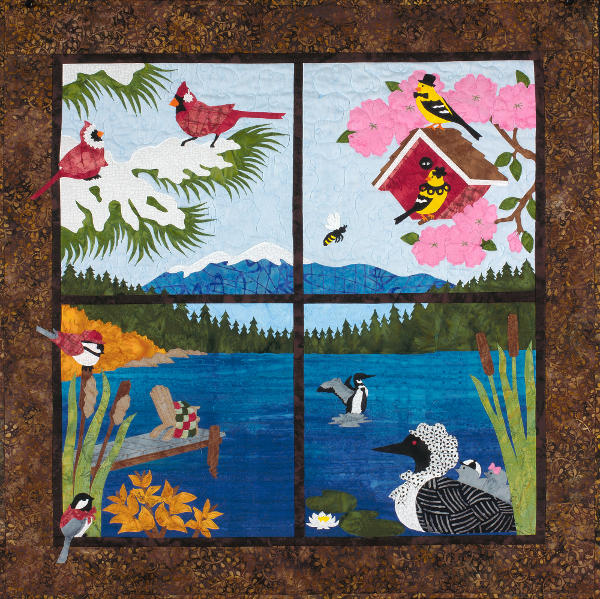 Add a valance, change the quilt block, add kayakers (or not), and some friendly chickadees for company while you quilt away. 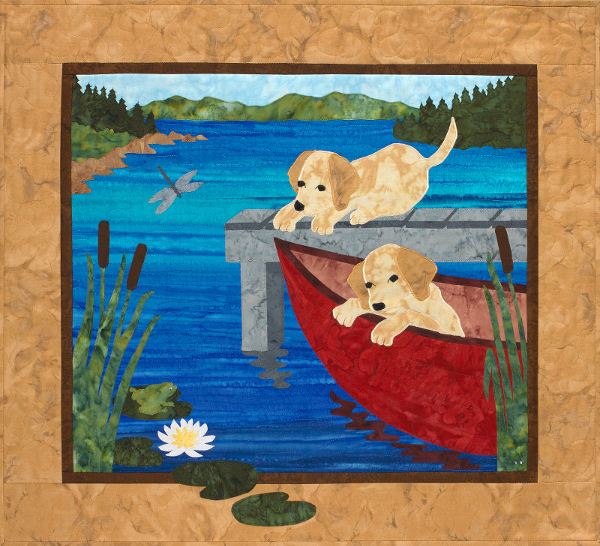 Read more about Quilting at the Lake. 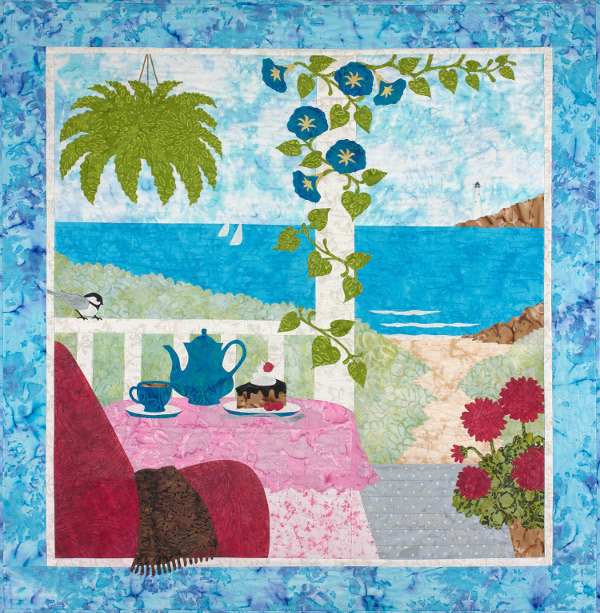 Imagine being on vacation and sitting at your sewing machine, stitching up your latest creation, all the while looking out your window at a peaceful, coastal scene. 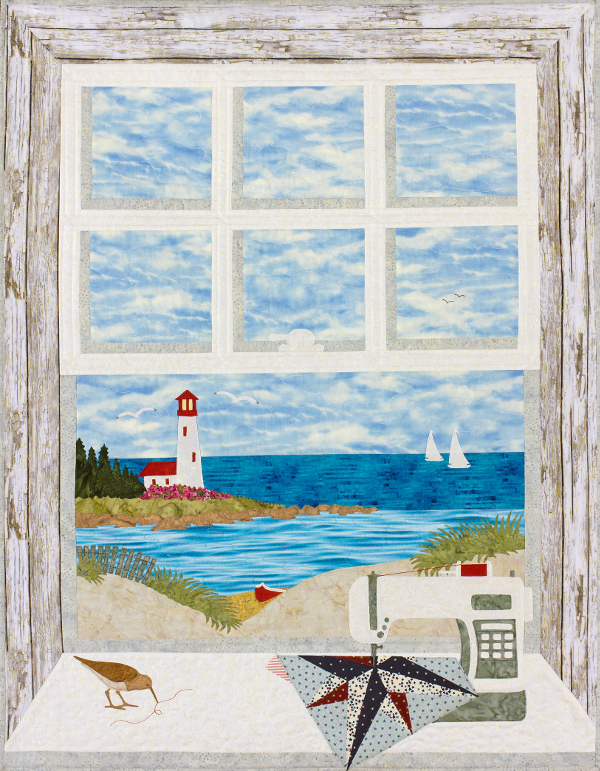 This could be your view every day of the year with my pattern, “Sewing by the Sea”! Read more about Sewing by the Sea. Bird watchers, this one is for you! 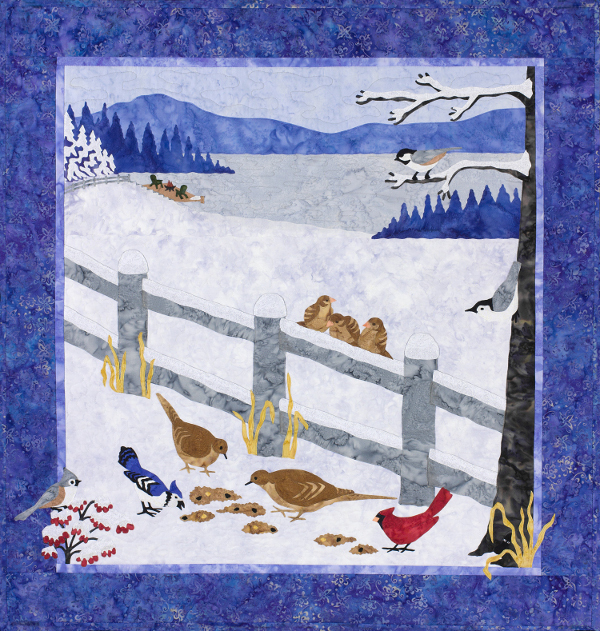 Feed the birds on your way to a cozy lakeside fire and enjoy the snowy lake and mountains too! Read more about Snow Birds. The Witchy Ladies have come to town! Start your visit at the “Magic Hats” to find the perfect pair of witchy shoes and matching hat. Or gaze into the “Crystal Ballroom” for predictions of future luck, or not. Then finish the day at the “Witches Brew” pub, but look out, there’s always some runaway frogs and bats on the loose! Read more about The Witchy Ladies. 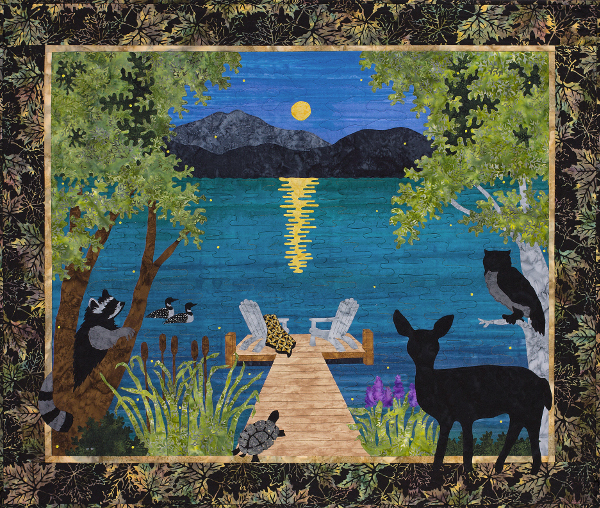 Enjoy a moon lit evening at the lake along with some woodland critters – a deer, raccoon, turtle, two loons and a wise old owl! 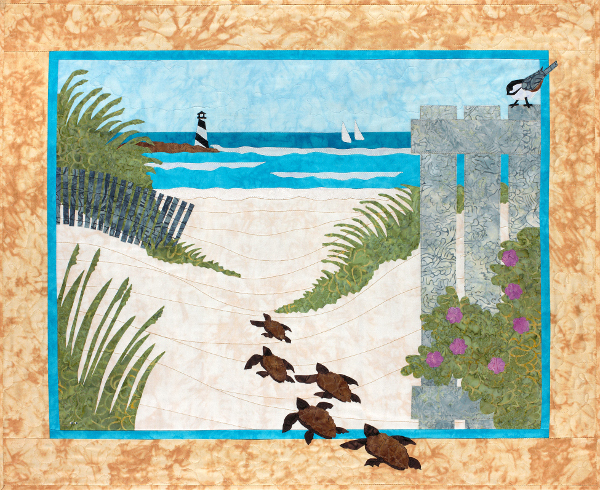 Make this beautiful 43”w x 36”h wall hanging with simple piecing and fast & easy fusible web, machine appliqué. Read more about Moon Lake. It’s summer vacation time again so let’s head back to the lake, the mountains, the wildlife and the peace of it all. Welcome to “Back Up North”! We offer two individual scenes, The Lakehouse and Lean-To Point, plus a larger three-in-one pattern called “Back Up North” which includes the Lakehouse & Lean-To Point, Plus the “Lakeside” scene. 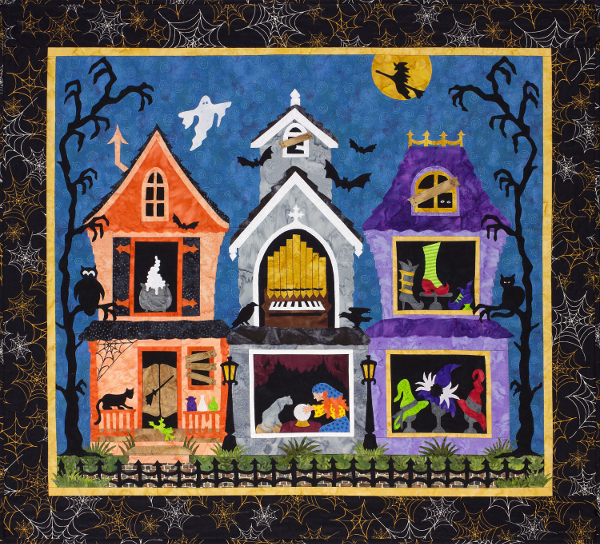 All are made with simple piecing, easy fusible web machine appliqué, and quilting as you go! Read more about Back Up North. This pattern was inspired by the “real” Bridge of Flowers that spans the Deerfield River in the village of Shelburne Falls, Massachusetts. It was built in 1908 and was originally a trolley bridge that connected both sides of the village. Years later an “auto” bridge was built and the trolley bridge was no longer used. In 1928 local citizens brought it back to life as a walkway filled with flowers and trees. 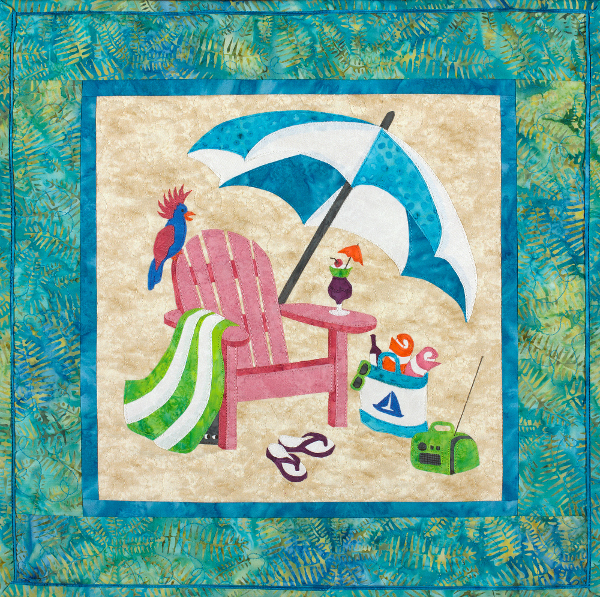 Beginners to advanced will enjoy making this pattern, with simple piecing and easy fusible web machine appliqué. Read more about Bridge of Flowers. For those who love the thoroughbreds, the pounding of the hoofs, the thrill of the race, the colorful silk jerseys, the winner’s circle, and the festive atmosphere, this one’s for you! Enjoy your day “at the track”! Read more about Run for the Money. 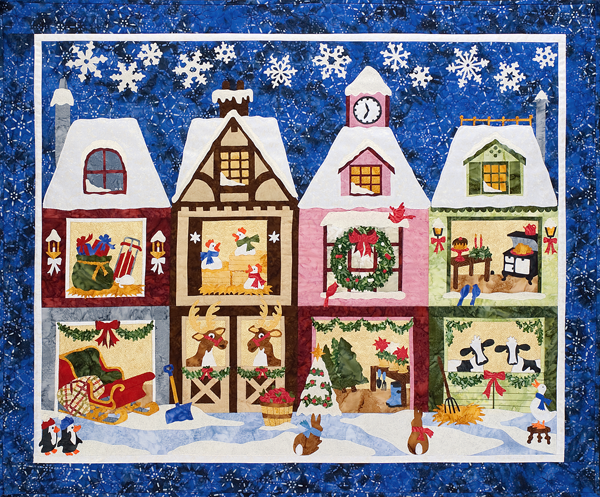 Four holiday barn patterns to make individually or combine them into a village scene as shown below. 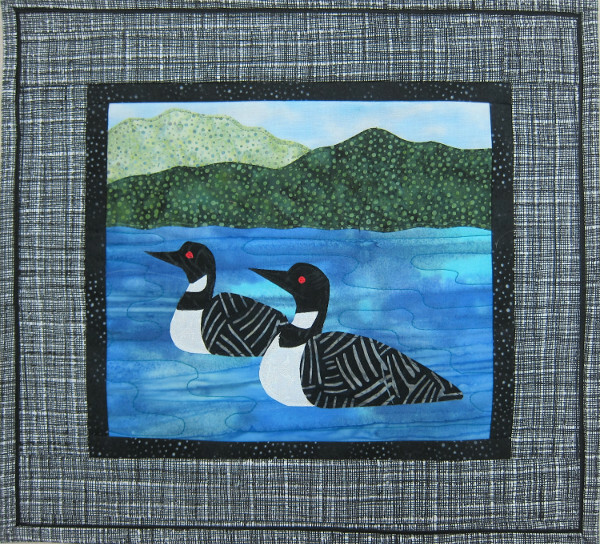 When combined, all four patterns will make a quilted wall hanging that is 41”x 34” with borders. 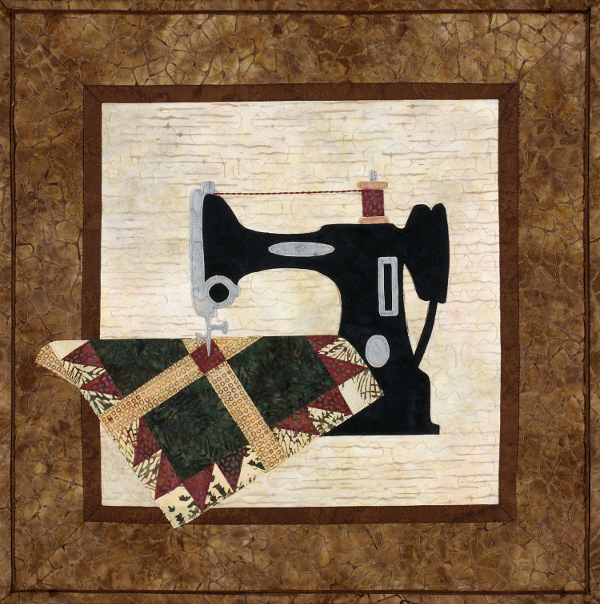 For beginners to advanced quilters to enjoy, made easy with simple piecing and fusible web appliqué. Read more about The Holiday Ladies. What is Mud Season”? It’s rainy spring days, new flowers, adorable baby animals and . . . . mud! 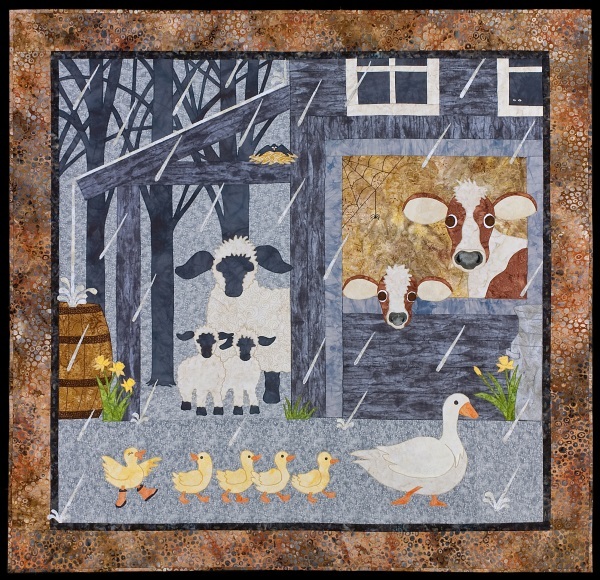 “Mud Season” is a combination of three patterns, “Little Woolies”, “The Cowgirls”, and “Rubber Ducky”. Patterns are sold separately but include directions to combine all three. Read more about Mud Season. 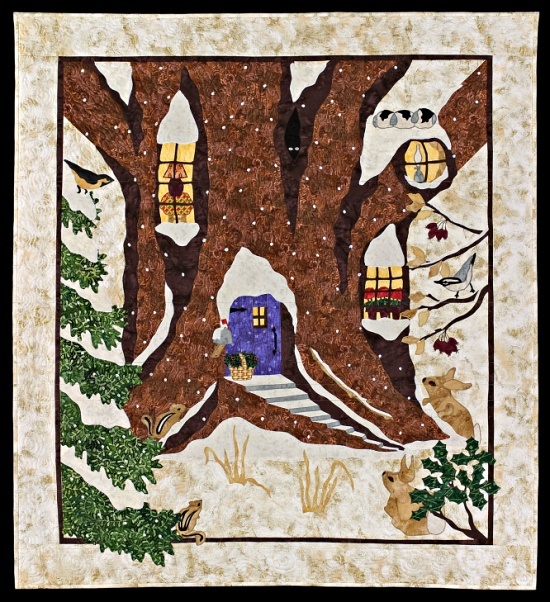 Deep in the snowy forest you’ll find a magical tree where the woodland elves live! They have many visitors; bunnies, chipmunks and curious birdies! 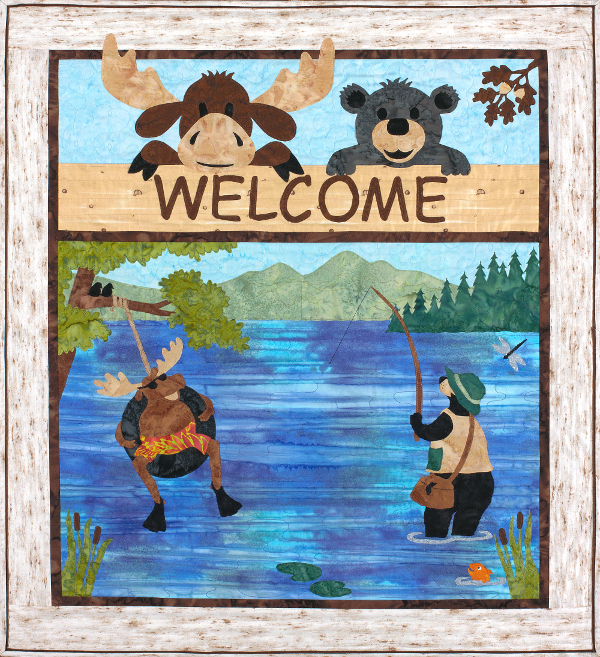 This wall hanging is made with traditional piecing, connector corners, raw edge fusible web appliqué and the appliqué pressing sheet! It measures 38”W x 42”H with borders. Bonus red cardinal pattern included to add to your pinetree top branch. Read more about Snowy Hideaway. 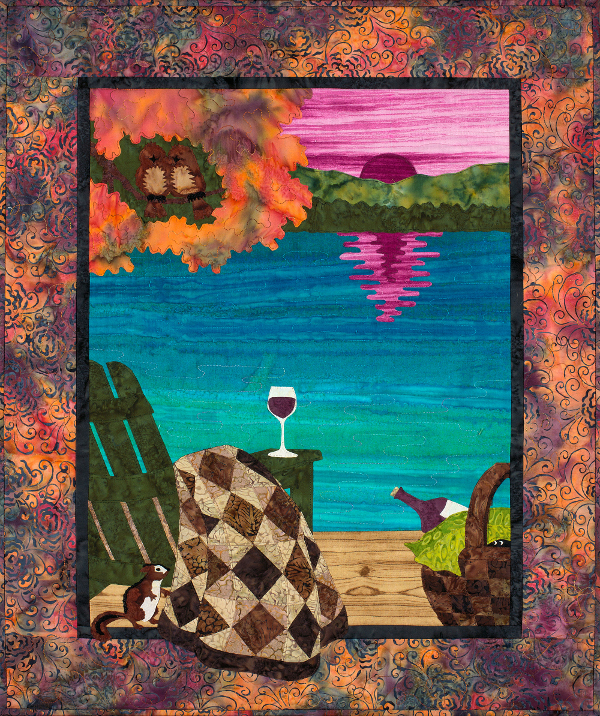 Make your summer vacation last all year long by creating one or all of my “Up North” patterns! 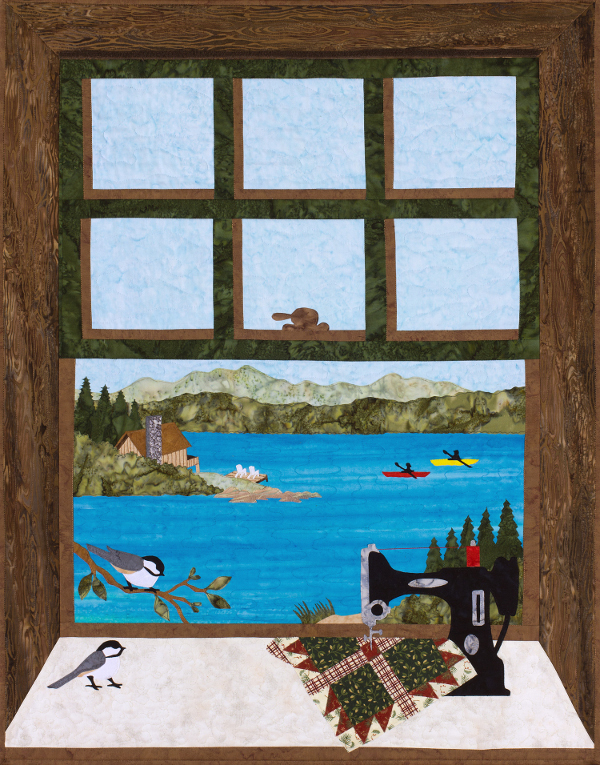 Choose three individual wall hangings “Deer Island”, “Lakeside Retreat”, “Chick & Dee” or make a complete northern vista with, “My Up North Front Porch”! 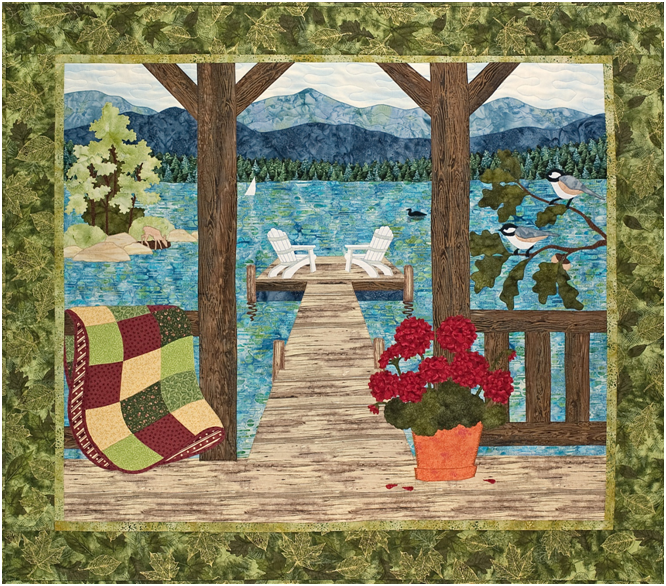 Includes appliqué patterns for the railing quilt, ramp, potted geraniums, porch, posts & railings, PLUS complete directions for combining all four patterns! Read more about Up North. Where should we go on Summer Vacation? How About “Over East!” Visit busy docks and lighthouses, watch seagulls, pelicans and sandpipers play in the surf, roam the sand dunes, explore coastal rocks or just sail away! 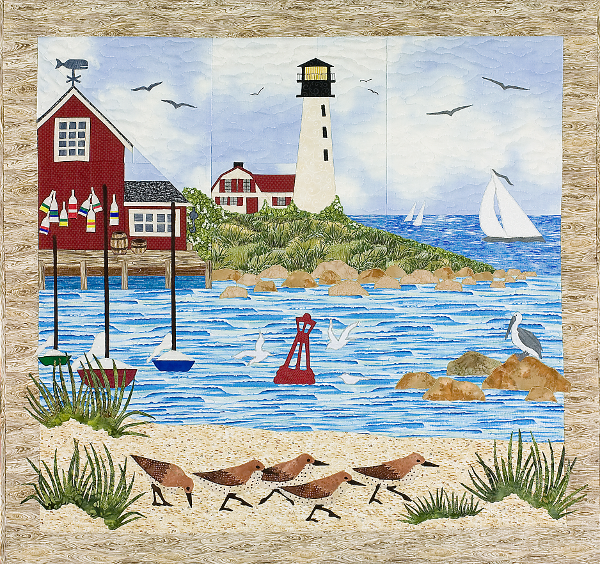 It’s all in my latest series; “Over East.” The four patterns that make up this series are “Down at the Dock”, “Harbor Light”, “Out to Sea”, and “Sandpipers on Parade.” Make one OR make and connect all four! Read more about Over East. 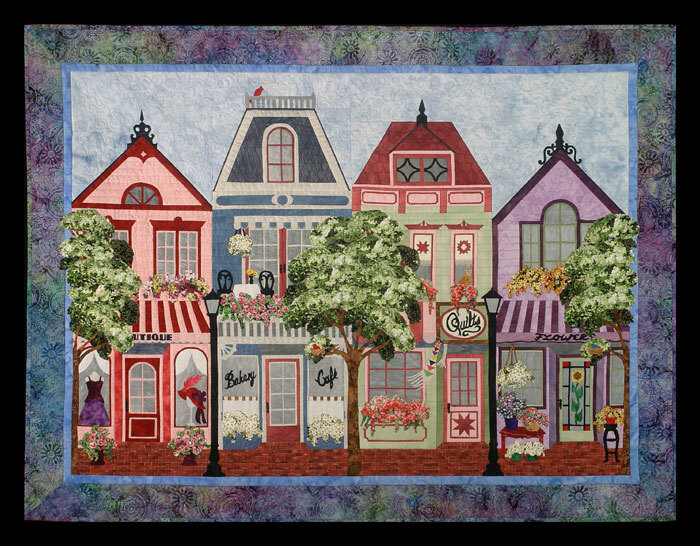 Each Lady measures 18” x 33”, and as with all the ‘lady’ series, the individual quilts are designed to connect to one another making a larger wall hanging. To combine these ladies, just leave off the left side flowers, attach your favorite ladies in any order, then if desired, add the flowers to either side. By the way, the flowers may be ‘swapped’ among all four Barnyard Ladies. Visit The Barnyard Ladies. These three ‘chatty’ hens are having a party! Dress them in bright fabrics; add beads, feathers or other embellishments! 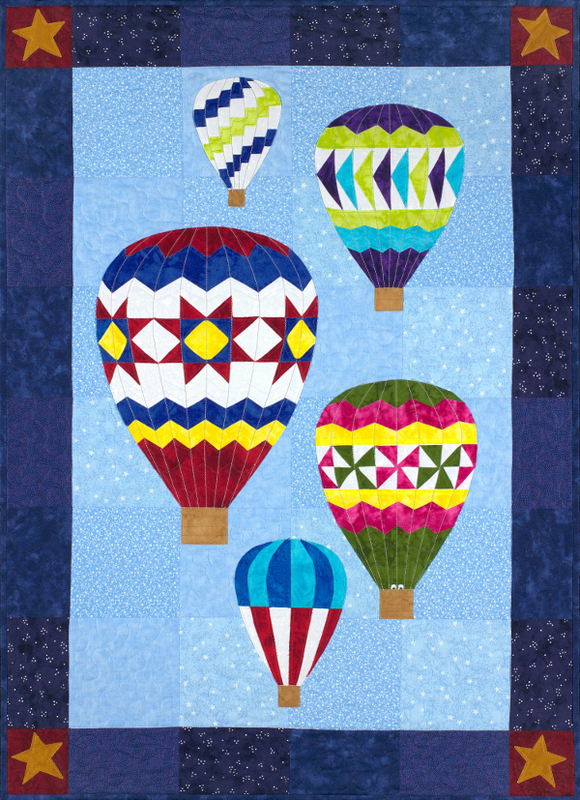 They are made using fusible web appliqué and traditional piecing. Finished size is 12” x 25” Visit The Hen Party. Each shop measures 6″ x 18″ without borders, (10″ x 22″ with borders). Make one or make several and attach them together to create a street of your favorite shops! Visit The Shop Ladies. Sold as separate patterns designed as stand alone wall hangings, each measuring 16″ x 34″ (with borders), or join them together–two, three or all four. Visit The Painted Ladies. purchase them directly from me using PayPal.